Consists of 30 checked and edited experimental procedures that illustrate new synthetic techniques or describe the preparation of particularly useful chemicals. Features procedures exemplifying important methods for preparing enantiomerically pure substances by asymmetric catalysis; details a reliable zirconium-based process for the coupling of alkynes and enones; concludes with the preparation of four useful starting materials. A section on waste disposal information is included. Larry Overman is Professor of Chemistry at the University of California at Irvine. He obtained a B.A. degree from Earlham College in 1965, and completed his doctoral dissertation in 1969 with Professor Howard W. Whitlock, Jr., at the University of Wisconsin. After a NIH postdoctoral fellowship with Professor Ronald Breslow at Columbia University, he joined the faculty at the University of California, Irvine, in 1971. 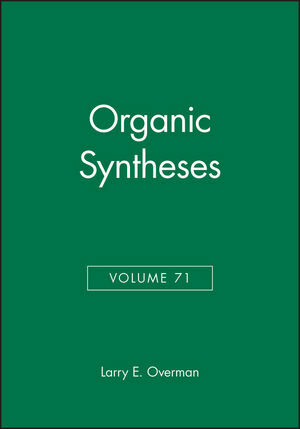 Professor Overman's research interests center on the invention of new reactions and strategies in organic synthesis and the total synthesis of natural products and their congeners. Using synthesis strategies developed largely in his laboratory, Professor Overman's group has completed total syntheses of more than 80 structurally complex natural products. Asymmetric Hydrogenation of 3-OXO Carboxylates Using BinaprutheniumComplexes: (R)-(-)-Methyl 3-Hydroxybutanoate (M. Kitamura, etal.). Direct Degradation of the Biopolymer Poly [(R)-3-HydroxybutyricAcid] to (R)-3-Hydroxybutanoic Acid and Its Methyl Ester (D.Seebach, et al.). 3-(S)-[(tert-Butyldiphenylsilyl)-Oxy]-2-Butanone (L. Overman &G. Rishton). Schwartz's Reagent (S. Buchwald, et al.). 4-Methoxy-4'-Nitrobiphenyl (J. Stille, et al.). Ubiquinone-1 (Y. Naruta & K. Maruyama). Benzoannelation of Ketones: 3,4-Cyclododeceno-1-Methylbenzene (M.Tius & G. Kannangara). 2-Methylene-1, 3-Dithiolane (K. Dahnke & L. Paquette). Methoxycarbonylmethylation of Aldehydes Via Siloxycyclopropanes:Methyl 3,3-Dimethyl-4-Oxobutanoate (H.-U. 9-Bromo-9-Phenylfluorene (T. Jamison, et al. ).